After closing a $3.5M seed round last month, Wiivv is officially launching today at TechCrunch’s CES Hardware Battlefield. The startup’s first product, BASE, is a custom, 3D-printed insole, that just launched for preorder on Kickstarter. BASE uses your smartphone’s camera to capture 5 photos of your feet, and turn those into a 3D printable model. And, before sending it off to be printed, users can customize their colors and even have their name engraved on the bottom of the orthotic. Of course custom orthotics are nothing new. 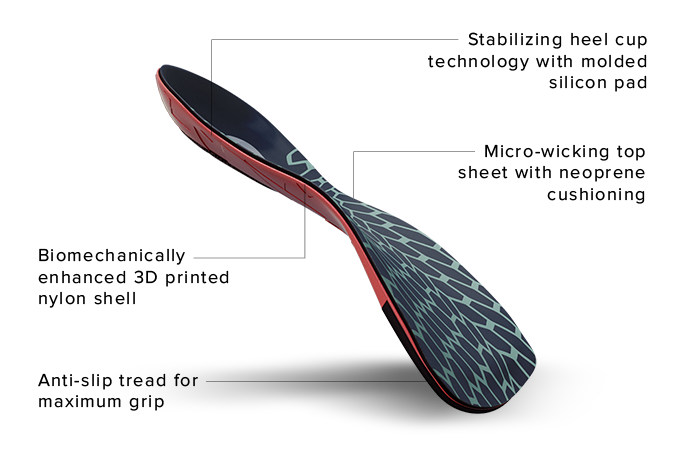 But Wiivv has combined a 2D-to-3D customization engine with an adaptive manufacturing system to seriously cut down the cost of custom insoles. BASE will retail for $75, hundreds of dollars less than traditional prescribed orthotics that you would get from a podiatrist’s office. The company was founded by Shamil Hargovan and Louis-Victor Jadavji, both of whom came from jobs in the 3D printing industry, with Hargovan coming from HP’s 3D printing division. While there are a few other startups that are 3D-printing custom orthotics, Wiivv is quick to note that their printing technology will eventually be used to custom build virtually anything for the body. And though BASE is currently the only product the company is selling, the company promises to release their second product once their campaign hits 5,000 backers. BASE can be preordered now on Kickstarter, and the company hopes to ship the soles to their earliest backers as soon as February.